It sounds like a bad sci-fi plot: a fleet of ‘bio robots’ are let loose in the world’s third largest ocean to study its physical and biological makeup. What could they be up to? Are they the first wave of an alien invasion, ala Independence Day or War of the Worlds? Or are they a human made technology turned evil, Terminator-style? Thankfully, the answer is none of the above: these bio robots will be used for the powers of good. They’re part of a new research collaboration between our scientists and their Indian counterparts at the Indian National Institute of Oceanography (CSIR-NIO) and the Indian National Centre for Ocean Information Services (INCOIS). In fact, we should probably stop calling them bio robots, as cool as it sounds. They are actually an enhancement of an existing technology, known as ‘Argo’ floats. These clever robotic sensors are designed to help us understand how our oceans are influencing the climate. About the size of a big barracuda, the free-floating devices are programmed to dive to depths of 1000m and 2000m over a ten-day period, and measure the ocean’s temperature as they go. They will repeat this cycle for years at a time. 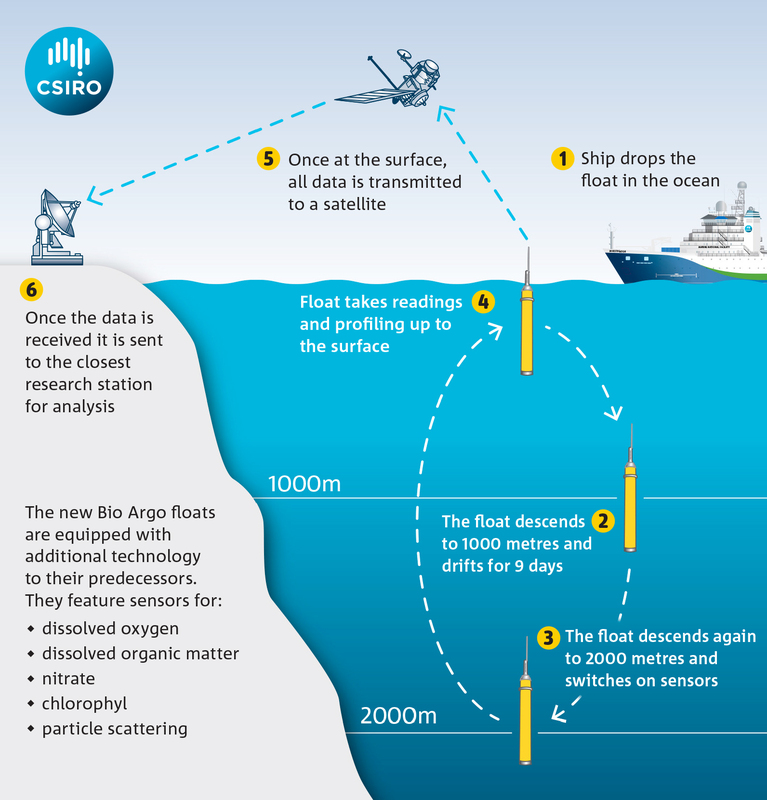 There is currently a network of 3,600 Argo floats dotted across the world’s oceans, owned and operated by more than 30 different international research organisations. The Indian Ocean is of vital strategic importance to its border nations. The east Indian Ocean alone is home to almost half of the world’s fishermen and women, and it yields around 8 per cent of global fish production. It contains the third-largest tuna fishery in the world, with an estimated value of US$2-3 billion annually. Plus, it contains mineral resources like copper, iron, zinc, silver and gold. A diagram explaining the Bio Argo float cycle (click through for a larger image). It also drives the climate of its surrounding regions, which make up more than 16 per cent of the world’s entire population. So, all in all, you can see why it’s important that we keep track of what’s going on below the surface. Our new Bio Argos, as we call them, will be launched in the Indian Ocean by Australian and Indian vessels midway through this year. They will be equipped with tiny sensors that can measure biological indicators within the ocean like dissolved oxygen, nitrate, chlorophyll, dissolved organic matter and particle scattering. Together, these sensors can tell us about the growth of plankton cells that drive the biology of the Indian Ocean, how much carbon they take up, how much gets used up the food chain and how much gets buried. Knowing about this growth is important for predicting how much food the Indian Ocean can produce, and how much carbon dioxide it can capture – which has a direct impact on climate. Collecting this data will give us a better idea of what keeps the Indian Ocean healthy and productive, allowing us to manage its resources more effectively. It will also help us understand how the ocean influences both the regional and global climate and extreme weather events, like the one that devastated the coastal waters and fisheries of north Western Australian in 2010-11. To find out more about the Bio Argo floats and this research partnership, check out our media release.